In to the bottles I added a squirt of dish-washing liquid, a squirt of paint and a little bit of water to thin it down a bit. There is no exact recipe needed for this, just play around with it. The more water, the foamier it was, but the less vibrant the colour. With my 2.5 y/o son I used just 2 colours. 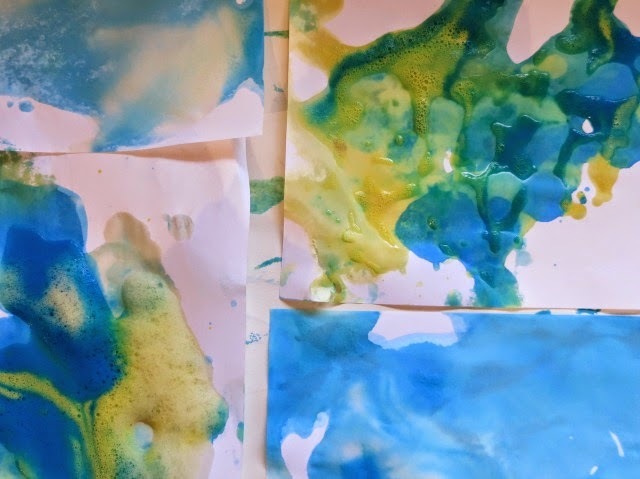 This was so that we could add in some basic colour mixing and talk about that. 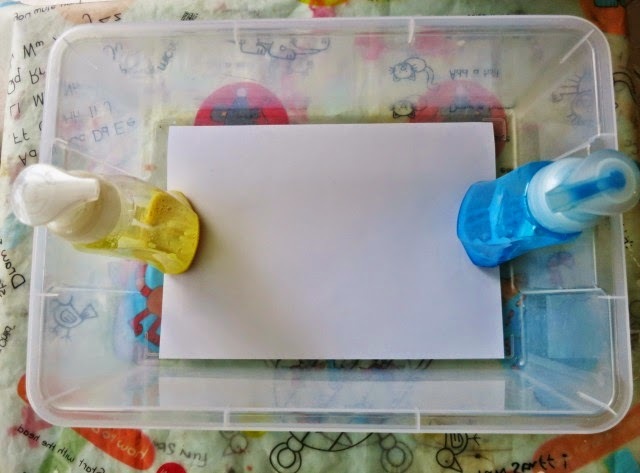 I presented the invitation to him with a piece of blank paper at the bottom of a plastic tub and the 2 coloured squirty foaming paint bottles at either end. 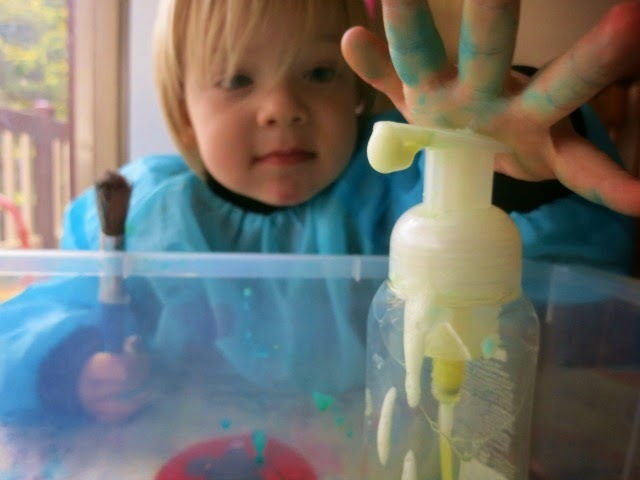 He discovered that the pump dispenser was harder to push down than when it just has the soap in it. 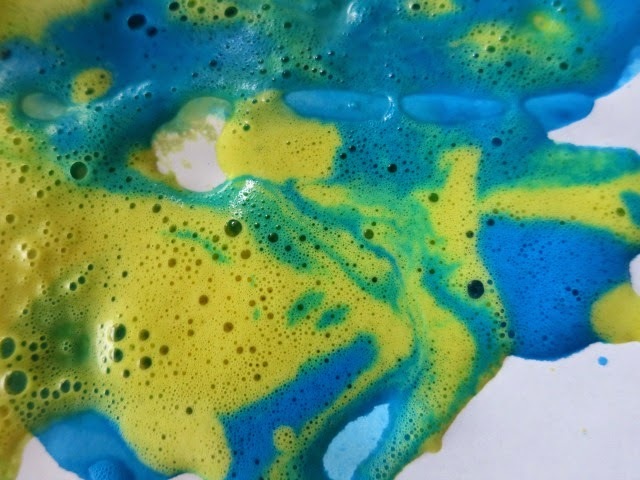 We talked about density here and how the paint mixture was "thicker" than the regular soap mixture. He often needed 2 hands to push the pump down properly, developing hand muscle strength as he played. 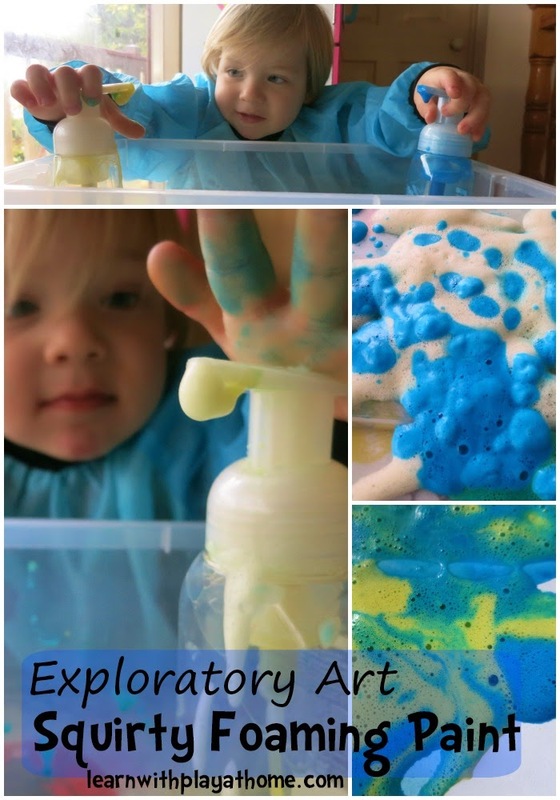 The frothy foaming paint was intriguing and required further investigation. What made it frothy like that? 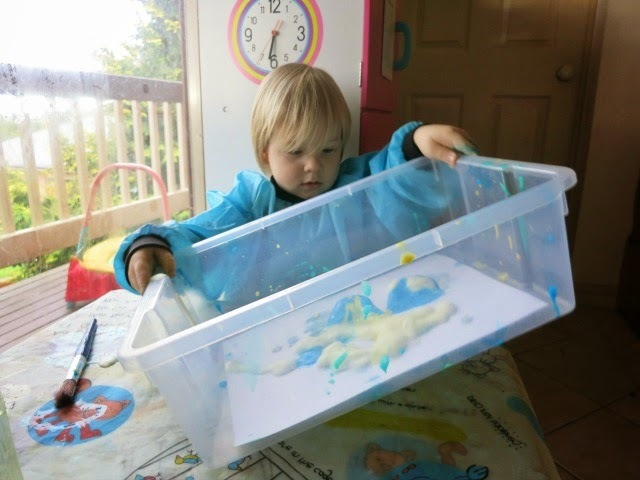 Using a tub was great as it meant that he could pick up the tub and let the foaming paint slide around the paper, creating different patterns. As the paint was getting lower, we added more water to see the difference. 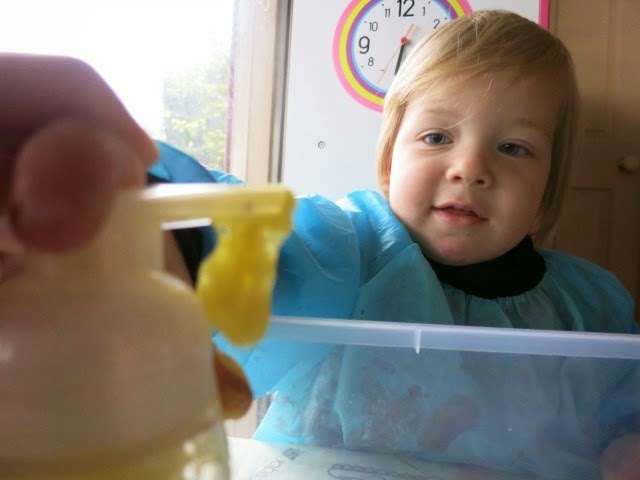 We ended up with a frothier paint but less vibrant colours. This also changed the viscosity of the paint. 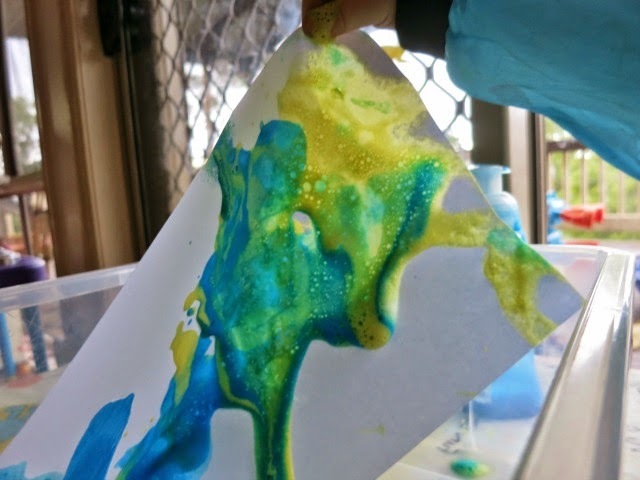 As it came out thicker, it slid and moved differently on the paper. 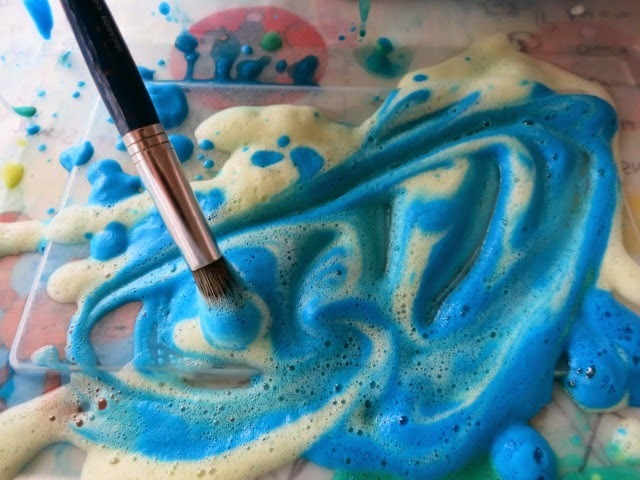 He asked for a paintbrush to swirl the foaming paints together. 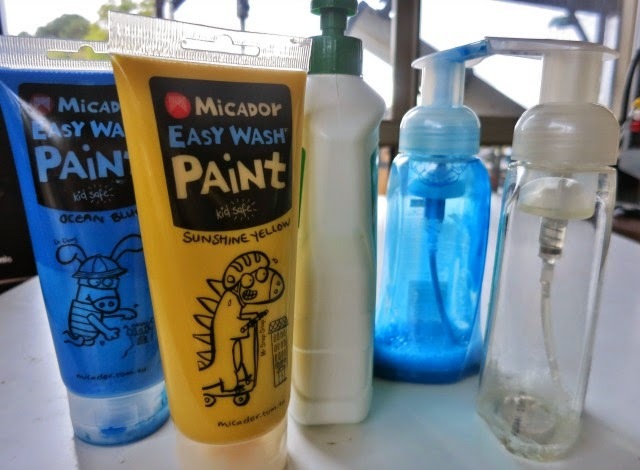 We observed that the lighter yellow did not help to transform any of the blue paint into green paint. 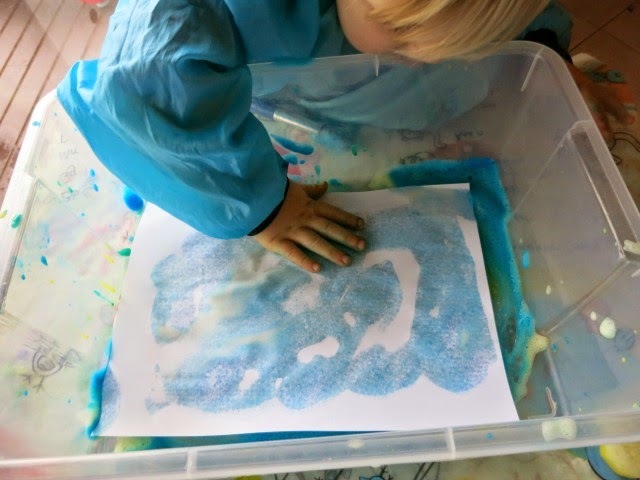 Remembering the mono-printing we did when we painted with a cardboard comb, he tried creating some masterpieces that way. 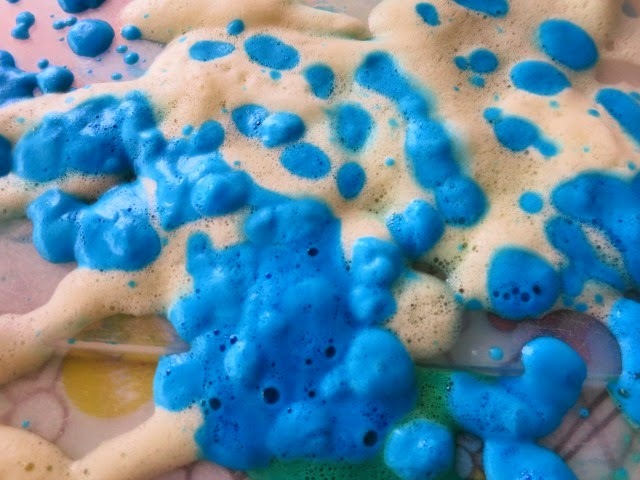 It was interesting seeing the difference in the foaming paint from wet to dry and the different effects some of the bubbles left behind. 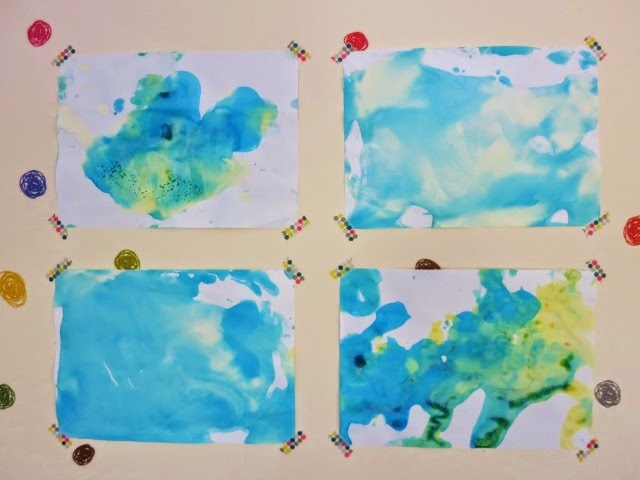 - Simplify this activity for younger children who've yet to develop the hand muscle strength and are struggling to squirt the paint out, by squirting blobs out for them and letting them swirl the foamy paints around. 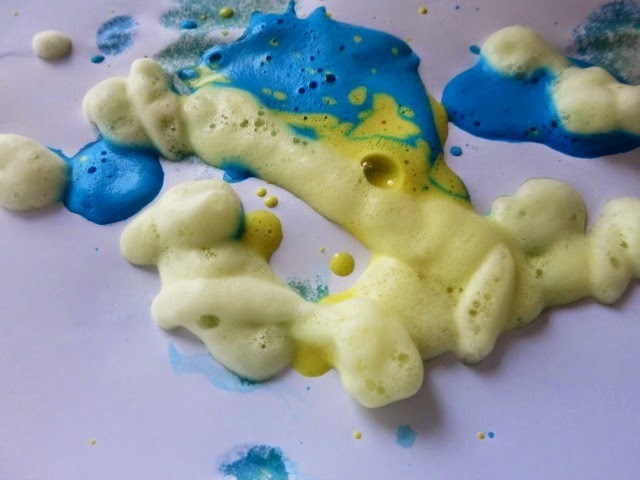 - Extend this activity by allowing children to mix their own quantities of dish soap, paint and water to test the different types of foaming paint made. 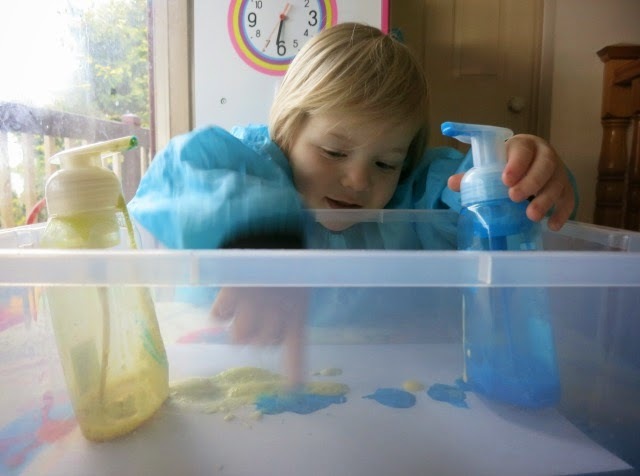 Ask children, what mixture makes the thickest foam/runniest foam/most vibrantly coloured foam paint? etc. Do you need more/less water? Experiment! 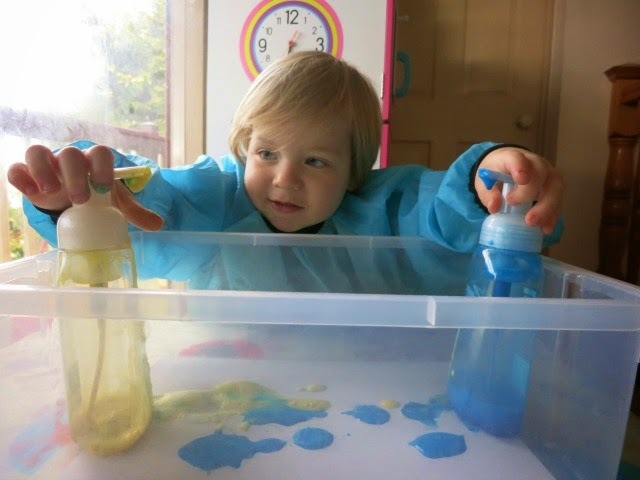 - Use new language and descriptive words like, "squirt," "foaming," "thick," "runny," "bubbly" etc. This will help with their language development. What a simple and fun idea! Great thinking putting it in a tub too.